Brought together into one volume by translator Michael Kandel, these “robot fables” are not really stories so much as cautionary allegories or references to fairy tales, only now the main characters aren’t princesses and ogres but intelligent machines. Thus in Mortal Engines we have extraterrestrial robots that take over entire planets, computers that fight Moon-dragons, robots that go off on galactic expeditions for their robot king, and similar tales that are surreal and strange because they’re unexpected. 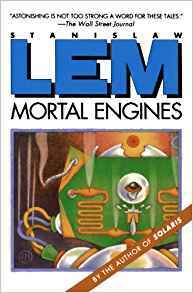 Lem’s insertion of mechanical intelligence into fables and folk tales gives the reader an unsettling feeling of anachronism even though the stories themselves follow the usual, even sometimes formulaic, patterns of the genre they’re imitating. While these fables are interesting as windows into Lem’s brain and as thought experiments about artificial intelligence and genre mashups, they’re not particularly gripping as stories. Nonetheless, they show how Lem worked through his ideas about AI as an Other, as a way by which humans could see themselves in a mirror held up by beings both like and unlike us. The last two pieces in the collection, however, aren’t short robot fables but full-fledged stories, one focusing on the famous Pirx the Pilot (“The Hunt”) and the other exploring questions of biomechanical invention and free-will (“The Mask”). While the former is a straightforward space-adventure story that brings up questions about the value of human vs. mechanical life and Pirx’s growing awareness of the resulting ramifications, the latter is a downright terrifying meditation on what it takes to build a ruthless, lethal “machine of death.” The style of “The Mask” is very different from the other stories; here, Lem places the reader in the brain of a creature that cannot even understand who or what it is until it develops into the killer that it’s been designed to be by the king of the realm. And yet, even with its programming and straightforward task–kill an allegedly-treasonous subject–the creature begins to question its goals and consider not killing the man that it was built to kill. To recap: robot knights, Moon-dragons, psychologically-complex multi-stage killing machines. There’s nobody like Stanislaw Lem, guys.